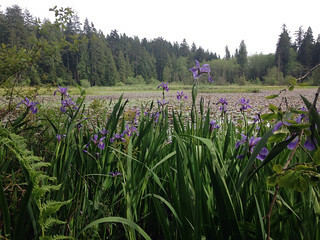 These purple iris flowers are an invasive species that are native to as seen in Beaver Lake in Stanley Park, Vancouver. 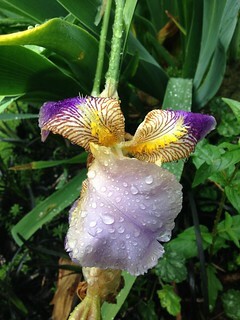 They are called Flag Iris (Iris psueudacorus) and also come in a yellow variety. Their rhizomes are not of any value to the fragrance industry but was used medicinally as an emetic, because of its high tannin level. 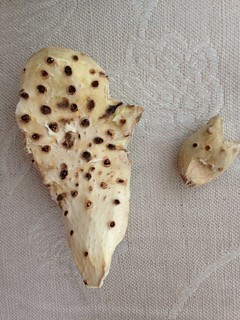 It can be irritating to the skin and have an acrid taste. On the brighter side, it was used to clean water from heavy metals, as the roots has the ability of soaking these up and filter them out so to speak. These are the flowers of Iris germanica, which along with Iris pallida (AKA Florentine Iris, Sweet Iris or Dalmatian Iris) is a cultivar that is a descendant from the historic Iris mesopotamica which grows in the Middle East (it's a rare flower nowadays, but can be sighted in the Galilee in northern Israel). The flowers too have a wonderful aroma - which I'm surprised does not get featured in fragrances more often: it is buttery and soft, almost like white chocolate. 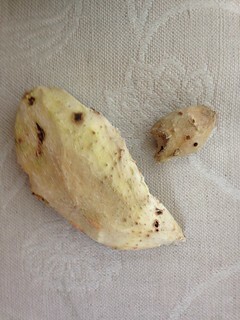 But not yet powdery and dry like the orris butter produced from the root of the same plant. 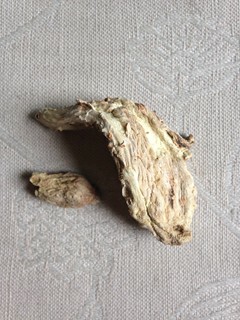 The dried rhizomes of the wild plant was used historically for perfumes and cosmetic preparations from ancient times, what we now call Orris Root. The ground dried rhizomes were used in powders, and the chopped up roots in sachets and potpourri. Essential oil of the plant are one of the most costly perfume materials, and take 5 years to produce: the first 2 years, the plants are grown undisturbed, to allow them to develop the desired irone, which are responsible for their characteristic aroma. Then the entire field is uprooted, the rhizomes need to be washed and cleaned of all soil and sand, and peeled by hand. They are dried in a shaded area and are left to mature for additional 3 years, after which they will be ground to a powder and then will be steam distilled to produce what is known in the industry as "orris butter" - a buttery, powdery-waxy textured substance that has the scent of Parma violets, carrots and a baby's head and excellent fixative qualities that made it a staple in the European perfumer's organ. It is used in countless high-end fragrances, including all the Guerlain classics, at least in minute quantities in the signature Guerlinade accord, if not in higher doses as is evident in Apres l'Ondee, l'Heure Bleue and Shalimar. I've used it many of my fragrances for Ayala Moriel Parfums, sometimes in minute amount just to create that soft, diffusive, powdery quality, for example in Autumn, Cabaret and Espionage; or to accentuate the violet-like quality I was after, for example in Rainforest and Viola and Indigo. Other times, it can even be the star of the show (even if quite demure) as in Sahleb, which is practically an iris soliflore. 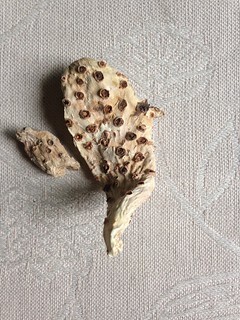 I've decided to experiment with this one piece of Iris germanica rhizome that I found in a neighbouring garden (they were hovering halfway above the ground, so I decided to pluck it away and see how the drying process goes). First I washed them from all the dirt, using a mushroom brush to scrub it off the hidden places. A week later, the bottom concave part of of it, which was sitting inside bowl, began developing a bit of mold hairs unfortunatley, so I had to peel that further. I changed its position so that it is as exposed to air and not inside a bowl but directly on the wood. It seems okay now and has dried up quite nicely already (just 16 days in) and has even began to develop a bit of the characteristic orris butter smell. 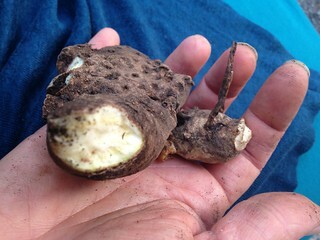 I'm pleasantly surprised so far; and mostly thrilled to have a whole root that I could demonstrate to my students with.